This is probably the longest I have ever gone between the actual date of our meal and my report. We revisited A Little Cafe in Voorhees, NJ on Saturday evening, November 27th. Joe and Carol B. and my wife, Kathy and I returned to this cozy little BYOB after a 14 month hiatus. The picture to the left is fittingly dark because the surrounding area WAS very dark on this late fall weekend. I may not remember everything we ate but I do know what wines we had with us. 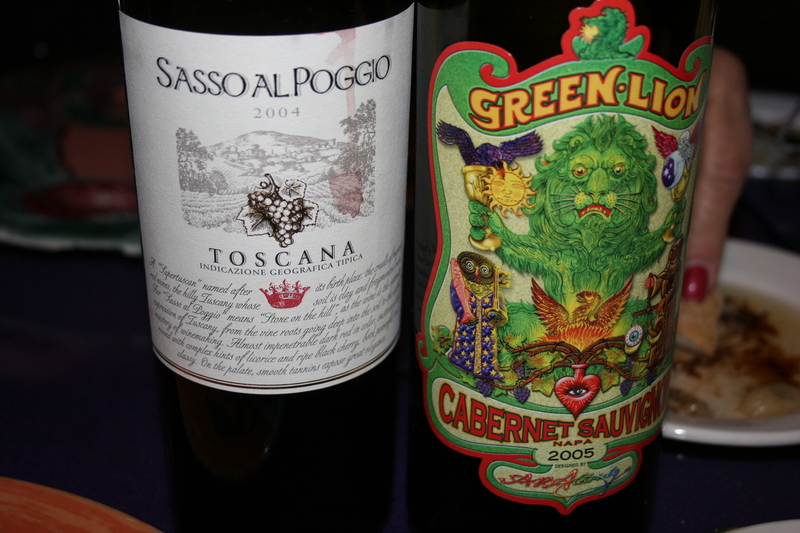 Joe and carol shared a 2004 Sasso al Poggo, Toscana. This “super Tuscan” offered ripe red fruit, hints of earth and licorice with smooth tannins and an overall softness on the palate. I had the bolder 2005 Green Lion, Cabernet Sauvignon, Napa. This one is another creation from Aussie winemaker, Chris Ringland except this time he brings his skills to California. This one is a really nice value that delivers REAL cab quality with fruit sourced from prime Napa growing sites (Pritchard Hill and Diamond Mountain) at an extremely affordable price. 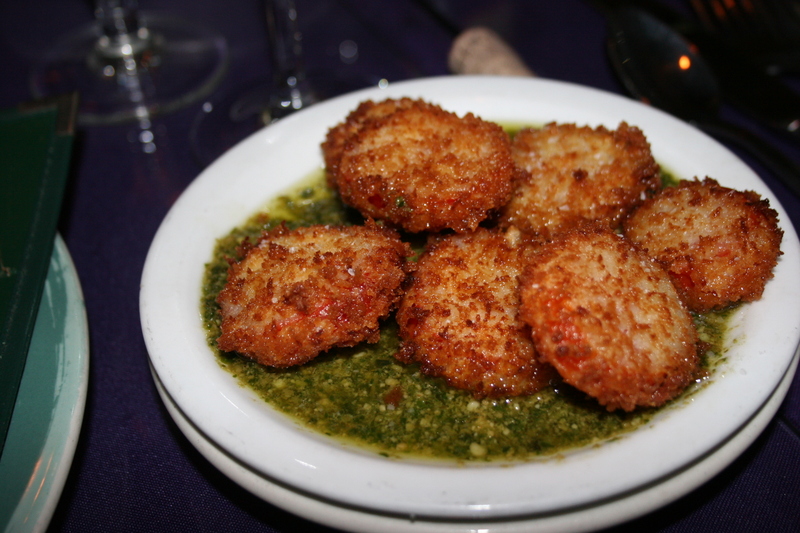 Along with the standard bread and oil for dipping we were presented with an attractive dish of fried green tomatoes in a tasty pesto sauce. There were two for each of us and we asked for, and received a second dish and I think we all agreed we could have made a complete meal out of this beautifully done starter. The breading was perfect and the tomatoes were first-class. 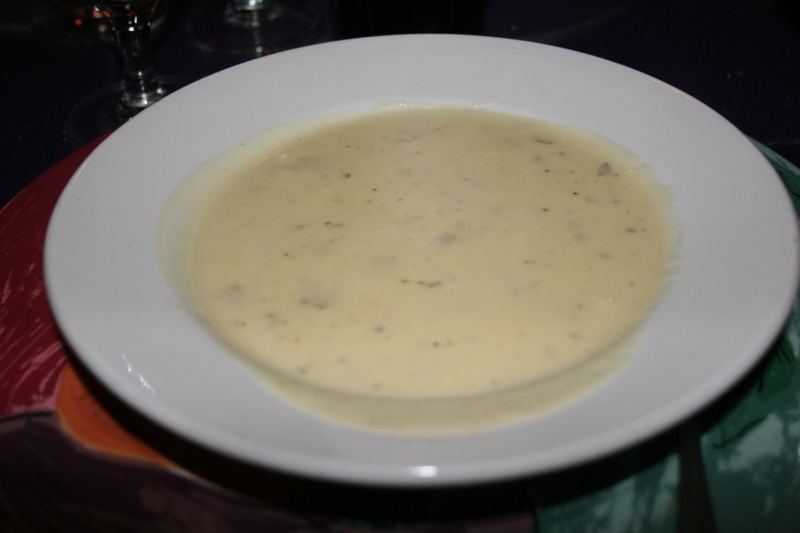 We each chose the Three Course Prix Fixe dinner and Joe and I started with the soup of the day which, in this instance, was a Potato Soup. Joe remembers it as having something spicy added to it. I, on the other hand, with senility setting in quickly, remember nothing but the potatoes. I am pretty sure we both enjoyed it, though. The ladies both had salads and I didn’t take a picture of them. 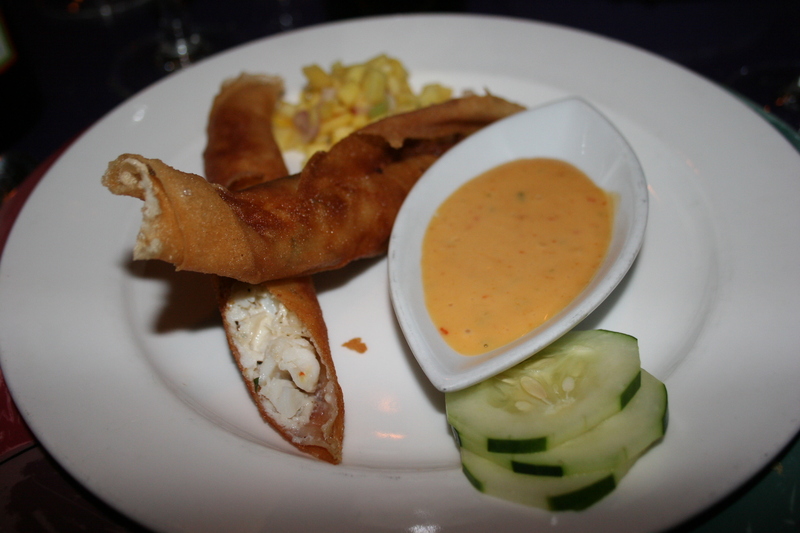 For my appetizer I went with the Crab Cigarettes, a Little Cafe Signature Dish – Jumbo lump crabmeat rolled in paper-thin crepes and served with a spicy red chili dipping sauce. I’d say that even the non-smokers of the world would enjoy these “cigarettes” so feel free to “light up” your meal with this appetizer. 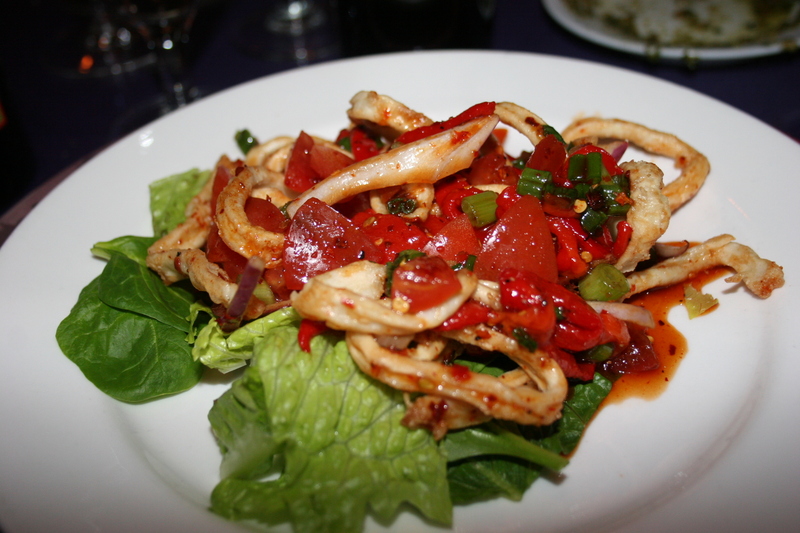 Joe went with the Spicy Calamari, lightly breaded and fried calamari topped with a hot and spicy red pepper relish and served atop a bed of crisp lettuce, Carol had a mushroom dish that I couldn’t find mentioned on the menu. Both of them liked their choices. For his entree Joe opted for one of the evening “specials”. 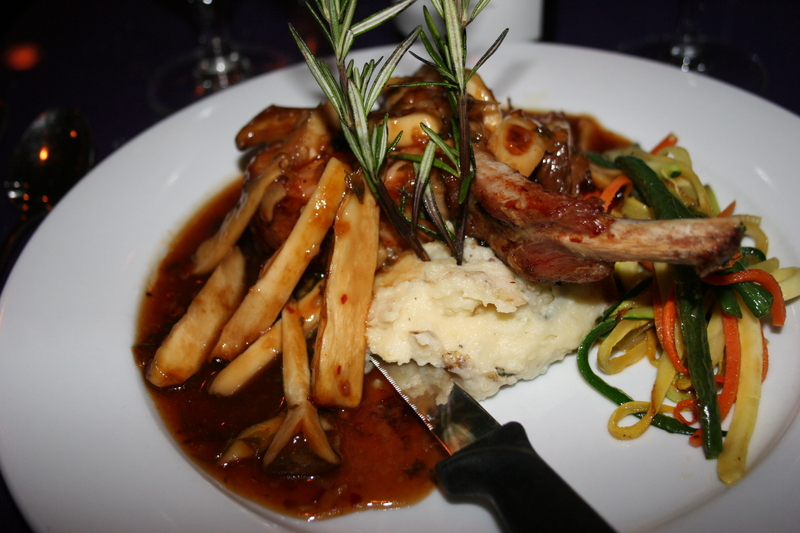 A baked pork chop topped with King Oyster Mushrooms and a plum wine sauce served with Yukon Gold mashed potatoes and Julienne-style vegetables. Kathy and Carol both seemed to be in a non-adventurous mood as they selected the Chicken Parmesan. 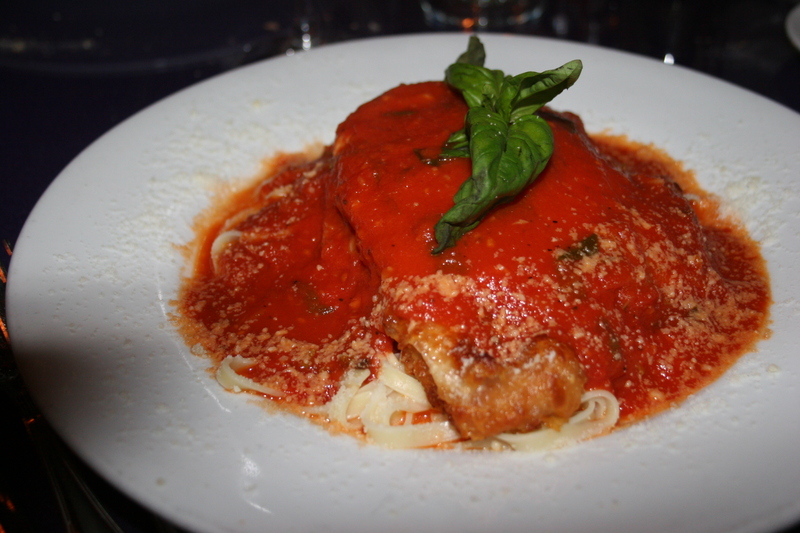 Carol traded the traditional pasta accompaniment for mashed potatoes and veggies while Kathy stayed with the linguine. I debated between the Marianne’s Meatloaf and the Chicken and Crab with the latter winning out in the end and I was not disappointed in my choice. 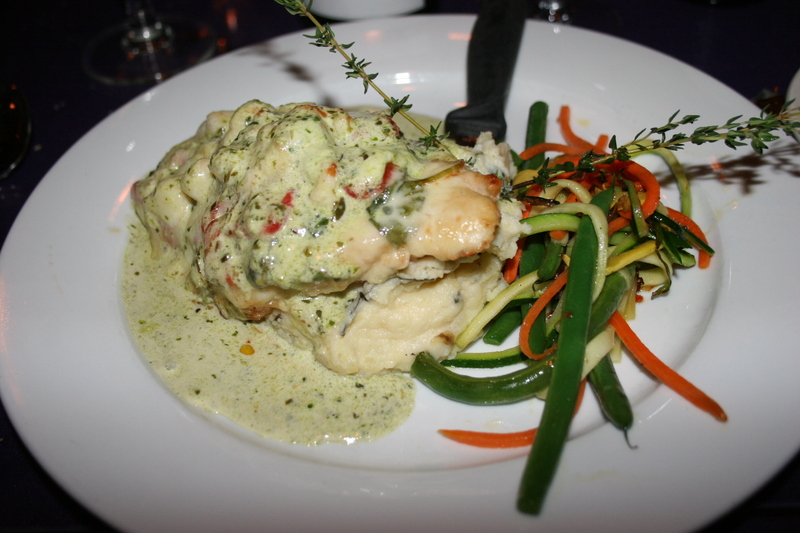 Sauteed boneless chicken breast layered with jumbo lump crabmeat, sauteed spinach, roasted red peppers, provolone cheese and topped with a pesto sauce. 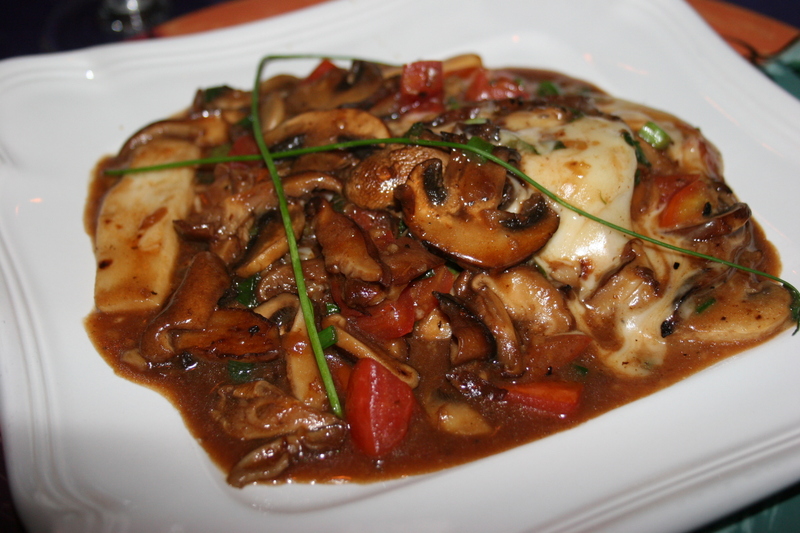 This tasty dish came with mashed potatoes and the Julienne veggies. I’m not a big fan of the Julienne veggies but the overall dish was very good and the portion large enough to provide lunch for the next day. 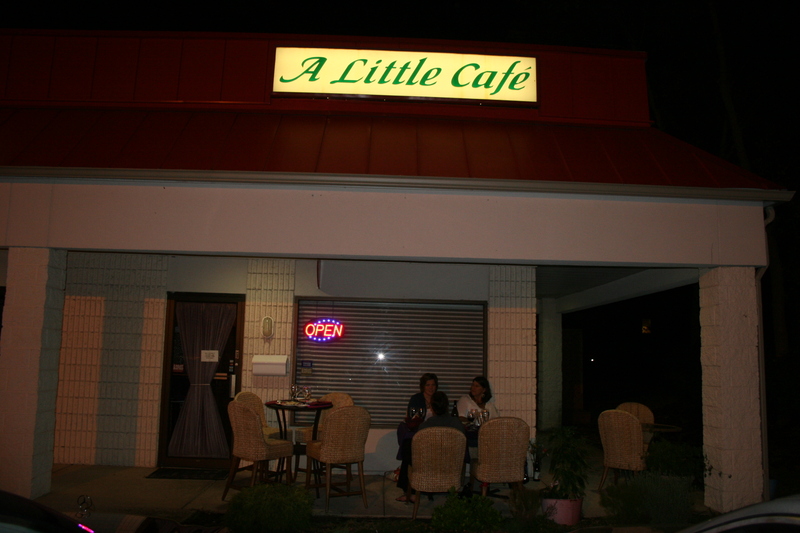 A Little Cafe is one of those places you can always count on for a good meal at reasonable prices and even though Chef/Owner Marianne Powell was not present on this Saturday evening, it was obvious she had left the place in good hands.